Established in 1973, EU Business School (EU) is an international, professionally accredited, high-ranking business school with campuses in Barcelona, Geneva, Montreux, and Munich. We provide small, dynamic classes in English, with the best of both North American and European academic curricula. Our pragmatic approach to business education prepares students for a career in today’s rapidly evolving and globalized business world. EU offers foundation, bachelor’s, master’s, MBA and doctoral programs, both on campus and online with business administration, communication, tourism management, international relations, sports management, digital media management, international business, marketing, finance, enterprise and human resources management, among others. Through our global network of academic partners, students can earn state-recognized degrees on EU campuses with the University of Roehampton in London, the University of Derby in the U.K. and the Universidad Católica de Murcia (UCAM) in Spain. Partnerships with Pace University in New York, the University of California in Riverside, Fisher College in Boston and Shinawatra University in Bangkok offer students the chance to earn a second qualification while studying in diverse and enriching environments. EU Group programs are accredited by the Accreditation Council for Business Schools and Programs (ACBSP) and the International Assembly for Collegiate Business Education (IACBE), recognized by the Council for Higher Education Accreditation (CHEA). We also hold International Quality Accreditation (IQA) awarded by the Central and East European Management Development Association (CEEMAN). The EU Group is also accredited by EduQua, the first Swiss quality label geared toward adult further education. EU campuses are located on the Mediterranean coastline, among the Swiss Alps, and in the economic capital of Germany, offering students the opportunity to live in four distinct and enriching environments. Students can transfer between campuses and explore the diversity of Barcelona, Geneva, Montreux, and Munich. This provides a great excuse to learn a language and meet a variety of people while experiencing new business-oriented opportunities. In addition, students can participate in exchanges to our partner institutions in the U.S.A., China, U.K., Spain, Thailand, Malaysia, Taiwan, Mexico, Brazil, Kazakhstan, Canada, and Russia, among others. The MSc is available as a one-year, full-time or two-year, part-time program (90 ECTS) and is designed for aspiring professionals with less than two years of work experience. 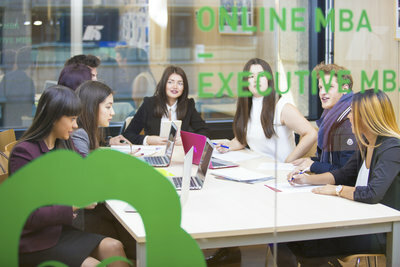 Students completing the program earn a state-accredited MSc in International Management from the University of Roehampton and a Certificate of Advanced Studies from EU Business School in one of 11 majors. In an ever-changing business landscape shaped by increasingly competitive markets, the entrepreneurial mindset’ is crucial for managers to bring about creative changes and growth. This program explores the main components of innovation and new venture creation and provides an insight into the entrepreneurial endeavor and the conditions within which it can be cultivated effectively. Focusing on the development of creative-thinking and executive skills, you will discover entrepreneurial challenges and solutions while taking the opportunity to evaluate and conceptualize business models. Rapid political, economic, social and technological changes are taking place across the world. New forms of leadership are required to cope with and actively shape these complex changes. This one-year three-term program explores the realities of being an authentic leader in the 21st century, from making strategic decisions, managing people, performances and negotiating effectively, to operational and marketing management. Focusing on the development of critical thinking and executive skills, this program will give you the tools to be an effective leader and adapt to future changes in business.